6/Al-An'am-111: And even if We had sent down to them the angels and the dead had spoken to them and We had brought together all things before them, they would not have believed, unless Allah willed. But most of them behave ignorantly. 6/Al-An'am-112: And thus We have made for every prophet devils from mankind and jinn an enemy, inspiring to one another decorative speech in delusion. And if your Lord had willed, they would not have done it, therefore leave them and that which they forge. 6/Al-An'am-113: And that the hearts of those who do not believe in the Hereafter may incline to them (to human and jinn satans) and that they may be well pleased with them. And that they may continue to earn what they have been earning. 6/Al-An'am-114: Shall I then seek a judge other than Allah? 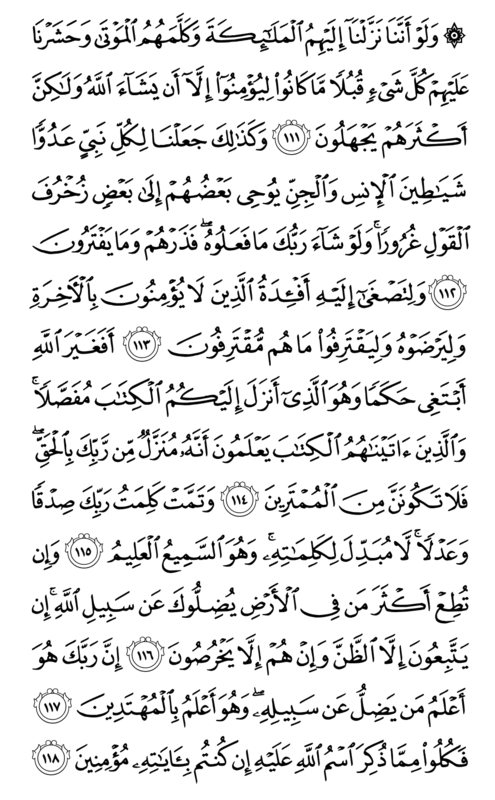 And He it is who has sent down to you the Book as explained (in detail). Those to whom We have given the Book know that it is sent down from your Lord with truth, therefore you should not be of the doubters. 6/Al-An'am-115: And the Word of your Lord has been accomplished with loyalty and justice. There is none who can change His Words. He is the All-Hearing, the All-Knowing. 6/Al-An'am-116: And if you obey most of those in the earth, they will lead you astray from Allah’s Way. They follow but conjecture and they only lie. 6/Al-An'am-117: It is your Lord Who knows who goes astray from His Way, and He also best knows those who have attained Guidance. 6/Al-An'am-118: Therefore eat of that on which Allah’s Name has been mentioned if you are believers in His Verses.